The saying "The Apple Doesn't Fall Far From The Tree" is quite applicable to me. I have a lot of both my wonderful grandmothers in me and from one trickled down not just the love, but the activism for dogs. 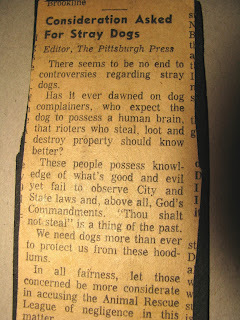 Beginning in the '50s I believe, grandmom was a member of animal rights group like the Anti Vivisection Society. 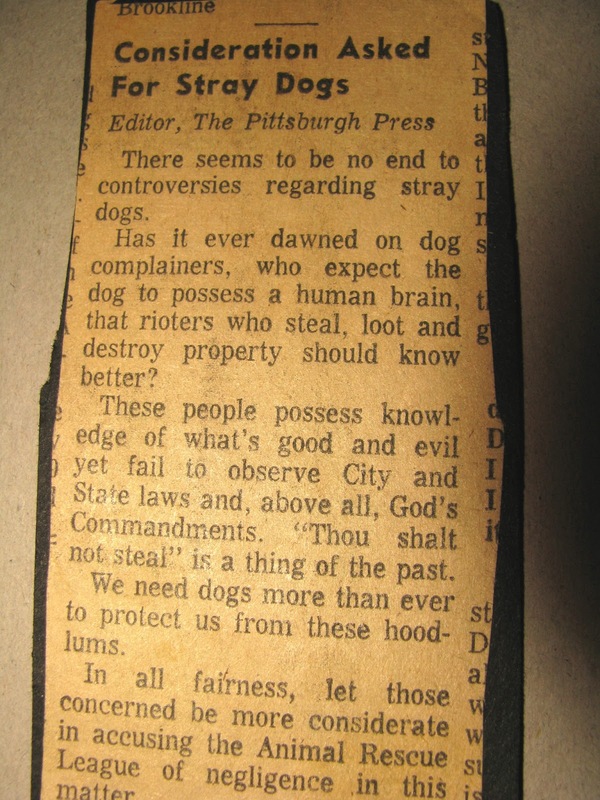 She dearly loved dogs all her life and in 1967 wrote this letter to the editor of the Pittsburgh Paper. I had never seen it until recently when my aunt mailed it to me. I'm so proud of her , and reminded so many years after her passing, what a great lady she was. It's almost time for The Westminster Kennel Club Show. I have not yet been to it despite wanting to go since I was 8. Last year I was in NY for fashion week and went to the Garden area while it was on, and I almost ditched my schedule to see if tix were still at the door. Kind of wishing I did. Not that fashion week isn't amazing, it is. But to do dogs and fashion , would be even more so don't you think? While I lament that I most likely will not get there this year, I checked out the website and list of vendors. Naturally one of things that attracts me to the event is the chance to shop for dog themed stuff. Back when there was a show in Philadelphia I did some damage. I realized that it's probably good I am not going, as I would spend way too much. Pretty sure anyone who reads a dog blog can get on board with that. 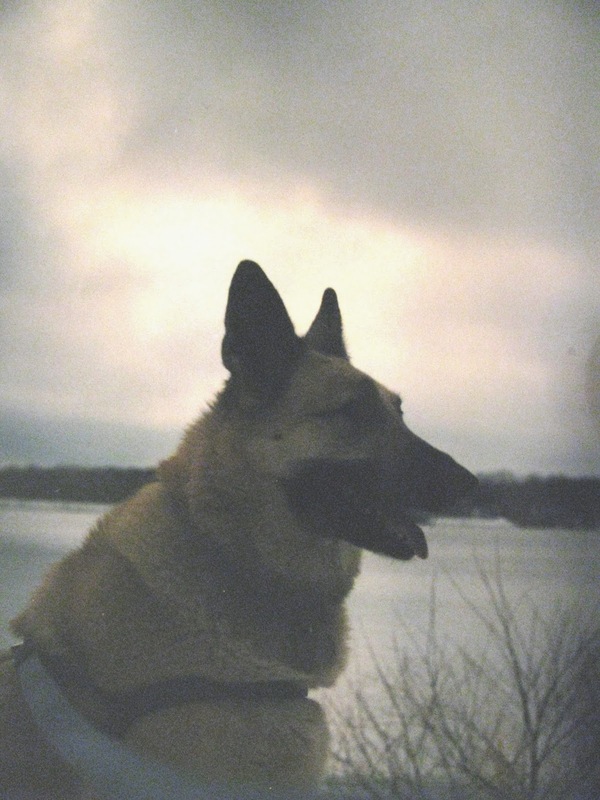 Glad that all those years ago I got my gold GSD charm back before the economy went haywire and gold prices so jacked. I've always wanted a matching ring but prices are about 7 times more now. One vendor listed is Omar's Originals jewelry. Just look at that Great Dane ring. Ok it's Over The Top, but I like it. There are other smaller pieces and it's all nice. If any of you have ever been to Westminster, let me know how the experience was. 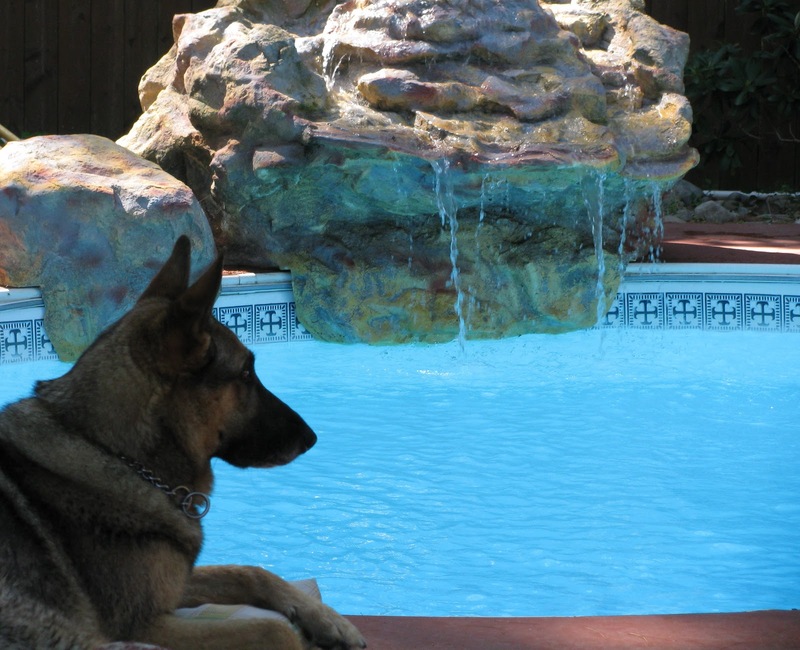 Did everyone and their pups have a great holiday ? Shasta loves Christmas and will lay near/under the tree, help unwrap her presents and knows where her stocking is. Above she plays with her triple light bulb toy from Target. So cute the checkout guy wanted one . He wasn't sure what it was, but he loved it. It's durable too. She got several new toys this year along with bags of treats. Then of course there was the ham at dinner. No she doesn't get a ham but part of ours and you can bet she loves that. It's a full day that wears her out . Christmas night naptime, anyone ? Wishing everyone a Barktastic 2013. 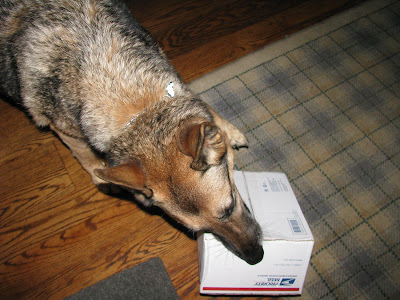 It's not every day or most days that a package arrives via the mail person for Shasta. So we were surprised when one showed up today . I had no idea what it might be until I recalled that our friends Sam and Paddy over at Barkzilla had emailed a month or so ago and said they were sending out some Frosty Paws goodies to some of their dog pals. Shasta loves packages and even opens them, so she got right to it. 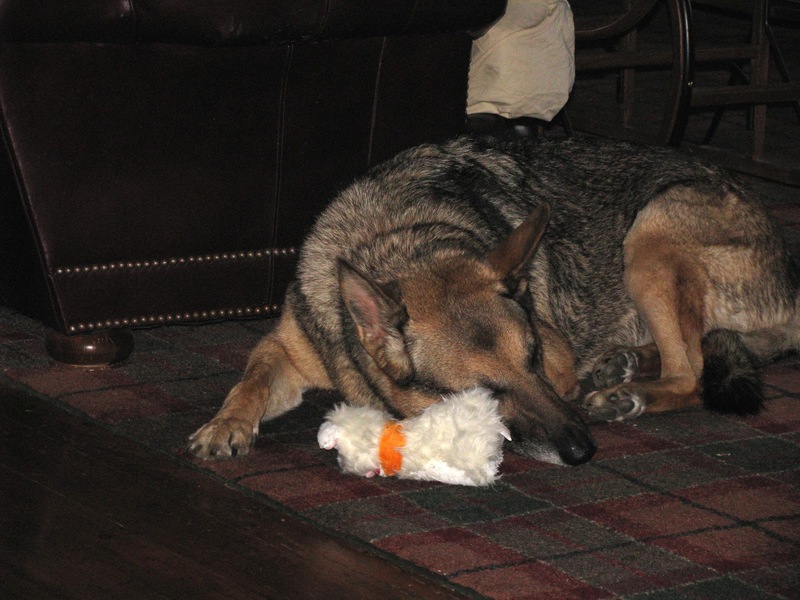 Inside was a cute Frosty Paws soft toy, that while not a dog toy , she happily took off with . Miraculously the toy is not yet shredded. So it was a good mail day for Shasta , who was so overwhelmed by her toy ( she hasn't had a new soft toy in ages) that she was ready to take a power nap. 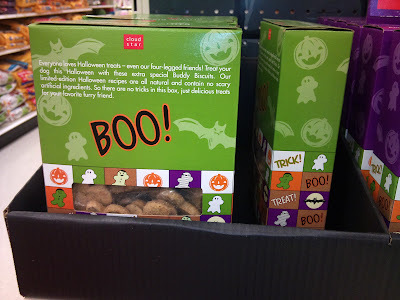 Like any dog lover I love to buy treats for my dog. 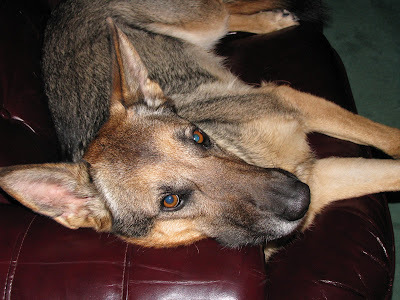 Since Shasta has exogenic pancreatic insuffiency it's something I don't get to do too much. She can't digest a lot of fat so low fat or very plain treats are usually it. 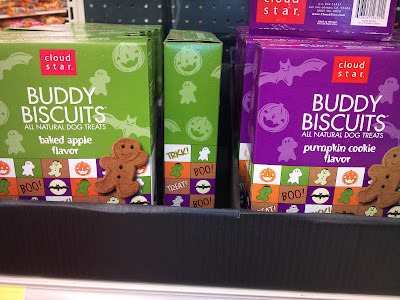 I was thrilled to see new Cloud Star Buddy Biscuits at my Target last month . We had good luck with the gingerbread ones I got one Christmas from at a pet boutique I stumbled upon in Philly but I hadn't gotten any since . Small town means we are lucky to have PetSmart. Target had the biscuits in both Pumpkin and Baked Apple. We had no luck with a different brands pumpkin so Baked Apple it was and she loves them . There is a short ingredient list with these and little fat or fatty ingredients. She tolerates them so well and they really do smell like apple pie. Good enough to eat. These were special Halloween editions and we hope Target gets in more holiday ones. Welcome to The Leashline. I'll be talking a lot about my dog, the beautiful Shasta and other dog related things like our fav books, treats , toys and more. I've had a a dog since birth and have loved them since then too. That first dog was a German Shepherd and since her there have been 3 truly amazing GSDs along with some wonderful other pups/breeds. Shasta is a beautiful, elegant, vivacious, wicked smart girl, with personality to spare. She was a rescue from a puppy mill, gotten out at a young age thankfully. She's taken full advantage of the lap of luxury she's landed in as she well should. She has a chair on the porch, her own umbrella to lie under , a pool to swim in and a lounge cushion for after swim among other things. The Leashline is a work in progress right now , so we'll be making changes and creating posts soon. Thanks for stopping by. Tails Up.